Las Vegas is one of the most famous and vibrant cities on Earth. Also nicknamed ‘Sin City’ and ‘The Entertainment Capital of the World’, there’s nowhere quite like Vegas, and the city is exceptionally well-known for its famous Las Vegas Strip: a long road lined with upscale hotels, crazy casinos, and a myriad of exciting attractions for all to enjoy. Vegas is most commonly associated with gambling, offering a long list of games of chance and skill, but is also a popular spot for live shows and entertainment like comedy, music, magic, and more. If you’re planning a trip to Las Vegas, it’s important to think about the weather. This is a vital part of any trip, with the weather having a big influence on the kinds of activities you can or cannot do. Since Las Vegas is located in Nevada in the middle of a desert, the weather conditions are generally quite easy to predict. It tends to be very hot and dry in the city for large parts of the year, but the temperatures can vary and there is some precipitation in certain months. With that in mind, let’s take a closer look at the weather statistics for Las Vegas in the month of April. The month of April is when the season of spring has really got underway. It's a time when temperatures are starting to get warmer, with summer right around the corner, and the average April temperature in Las Vegas is 66 °F (19 °C). The average highs in April in Las Vegas are 78°F (26°C), while the average lows for this month are 51°F (11°C). Las Vegas April temperatures are therefore higher in general than the previous month of March, but not quite as warm as the following month of May. In general, therefore, the days are relatively warm in April in Las Vegas. In terms of precipitation, Las Vegas is a very dry city in general. This is due to its location in the state of Nevada, which sees a very low annual amount of rainfall. The chances of rain in Las Vegas in the month of April are very low, with an average of just 5mm of rain falling in this month. There are typically only three rainy days in Las Vegas in April, so if you're in the city at this time of year, you have a very low chance of seeing any precipitation. Statistically speaking, rain has a higher chance of falling at the beginning of the month than the end. Due to the arid, dry location of Las Vegas, the humidity ratings in the city tend to be very low throughout the year, and this is especially true in April. April's Las Vegas humidity ratings tend to range between 13% and 44%. In very rare cases, the humidity can exceed these levels, but air conditions are generally dry. The wind speeds during this time of year tend to be quite low, with an average of around 4m/s, which is classed as a gentle breeze. As one of the sunniest cities in the United States, Las Vegas sees around 12 hours of sunshine per day in April. Due to the mild to warm temperatures at this time of the year in Las Vegas, as well as the low humidity ratings, gentle winds, and high amounts of sunshine, April is an excellent month to visit Las Vegas for a wide variety of attractions and activities. You can enjoy a lot of outdoor fun in Las Vegas in April with the weather conditions being perfect for trips to local natural destinations like the Grand Canyon or nearby kayaking spots. Outdoor sports like golf can also be enjoyed at this time of year too. It’s also a nice time of year to simply walk along the Strip and admire the various hotels without feeling the need to rush indoors and warm up. 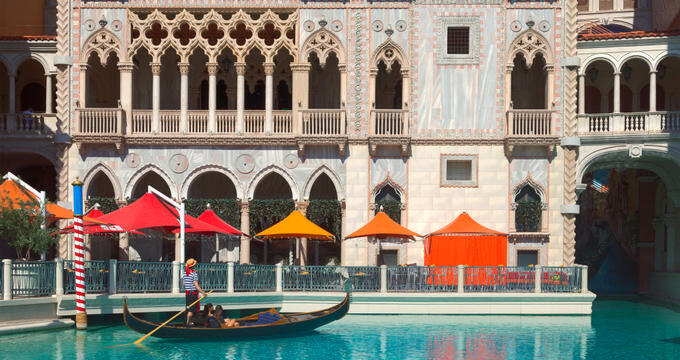 Of course, many of Las Vegas’ most popular attractions all occur indoors anyway, so April is also a good month to visit the city and enjoy these activities. The casinos, stores, malls, restaurants, and other indoor attractions are all as popular as ever at this time of year. Gambling in the many casinos is a lot of fun in Vegas in April, and there are plenty of exciting live shows to check out too, with many hotels having their own resident acts.